Youth in Arts invites exceptional young artists to take the stage and create an original multimedia production focused on inclusion. We will explore what it means to stand up for yourself and others and share your voice. Teens will participate in theatre, singing, dance and visual arts to bring their story alive. 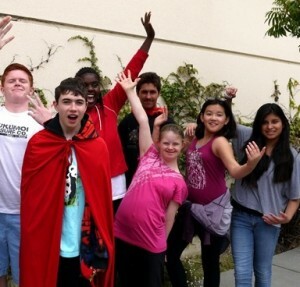 Teens work with professional artists and rotate through core classes in voice & acting, dance & music and visual arts. On Friday, young artists will present their final work for family and friends. A potluck lunch celebration follows the performance. Students of all abilities are encouraged to apply. Limited scholarships available.